We may be several weeks into the new year, but politics at Westminster continues to be dominated by Brexit. And after the Prime Minister’s humiliating defeat in parliament over the UK’s Brexit deal, the path ahead out of this mess remains unclear. The season of goodwill seems a distant memory, as the PM stubbornly refuses to listen to reason or change tact despite suffering the worst defeat in parliamentary history. As West Dunbartonshire’s representative at Westminster, I am clear that I will not support a damaging Brexit deal which threatens the jobs and livelihoods of my constituents. The reality is that there is no ‘good Brexit’ – as even the UK government’s own analysis shows that, regardless of the scenario under which the UK leaves the EU, it will be harmful to the economy. A ‘no deal’ Brexit is the worst possible outcome, and the evidence is overwhelming that this would have a devastating impact on Scotland’s economy. Just this week CBI Scotland, which represents thousands of local businesses, warned that crashing out of the EU could hit Scotland’s economy by an eye-watering £14 billion per year. This would have a catastrophic impact on jobs, living standards and public services. A ‘no deal’ Brexit would disrupt key transport links and supply chains that businesses of all sizes rely on; threatening food supplies, medicines and other essential items. As we move ever closer to crashing out of the EU on 29th March, companies like Dyson, Sony and P&O have all announced they will be moving operations out of the UK to protect their interests in the EU. Regardless of how you voted in 2016, nobody voted to make themselves poorer. West Dunbartonshire, like the rest of Scotland, voted overwhelmingly to remain. Yet we face being dragged out of the EU against our will by a Tory government that we didn’t vote for. In 2014 we were told to vote no to independence to protect our membership of the EU. We were promised that Scotland would be treated as a valued, equal partner in the United Kingdom. But the truth is that all through this shambolic Brexit process, the interests of Scotland have been ignored by the UK government at every turn. This is a crisis of the UK government’s own making, and Scotland risks being dragged down with it unless there’s a radical change in approach. We deserve so much better than this. The case for independence is stronger than ever, and it’s clear that Scotland’s future must be in Scotland’s hands. 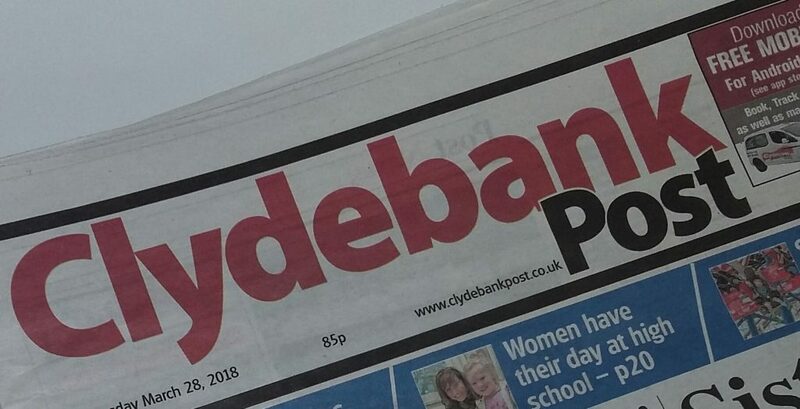 This article appeared in the Clydebank Post on Wednesday 30th January 2019.